< Call to order > TM G.S. VPE TM G.S. conducted “Tongue Twister” for everyone in the beginning of the meeting. It was a good practice and fun ! < Toastmaster of the Morning (TMOM) > TM S.K. – All the members who signed up attended the meeting today. TM S.K. smoothly emceed the meeting without any problems. < Word of the Day > TM G.M. 14 members used it during the meeting. < Good & New > TM H.H. – 6 members including 1 guest told their good short stories for warming-up. < News of the week > TM S.H. – “Amendment of Immigration Control and Refugee will be made” TM S.H. explained what will change if the new low regarding immigration will be enacted ? A problem is that criminal rate appears to rise. And the possible solutions are education about Japanese language and Japanese culture, and minimize the salary gap. Title: “Icebreaker (self-introduction)” TM H.K. — He is working in energy industry. CO2 emission causes an issue today. His message is, just a little effort will curb a CO2 emission. If everybody in the world would try, it would be a big change. Title: “Magazines that change the world” TM Y.K. It was about a magazine “Big Issue” which is sold by homeless people on the street. She explained about the magazine clearly, interestingly. It would be started in the UK and is being published all over the world. It contains various kind of articles. Her speech make us interested in the magazine. Title: “Rome that I met in Damascus again” TM N.S. TM N.S who attended as Special Guest talked about a story when she travelled to Syria in 2011. She was unexpectedly celebrated by Syrian people when Japan team won in the soccer game between Syria and Japan. Also, a Syrian boy kindly tried to help her when she was lost. It was surprising that Syria was a wealthy country before the civil war. She learned a lot of things through studying foreign languages and it could make her get a job. < Table Topics > TM T.K. (1) What food do you recommend foreign tourists ? (2) In what season do you recommend for visiting Japan ? (3) Which place of Japan do you recommend to visit ? (4) Which place of Japan do you recommend to take a picture for posting on the internet ? (5) Which place of Japan do you recommend for cherry blossom viewing ? 5 speakers gave improvised speeches. General Evaluation: TM S.W. It was good that TM Guest N.S. attended and gave a fantastic speech. He mainly pointed out some goodness on the meeting. Also he noticed the toastmaster program is changing to Pathway and suggested we should continue to study public speech and leadership. – Prepared Speech: TM Y.K. – Table Topics: TM M.T. – TM G.S. gave a couple of notifications. We had a regular meeting as usual today. On the other hand, it was the last Saturday in October and some people would go to Halloween parties tonight. Actually, there was a lot of people who dressed up in Shibuya. 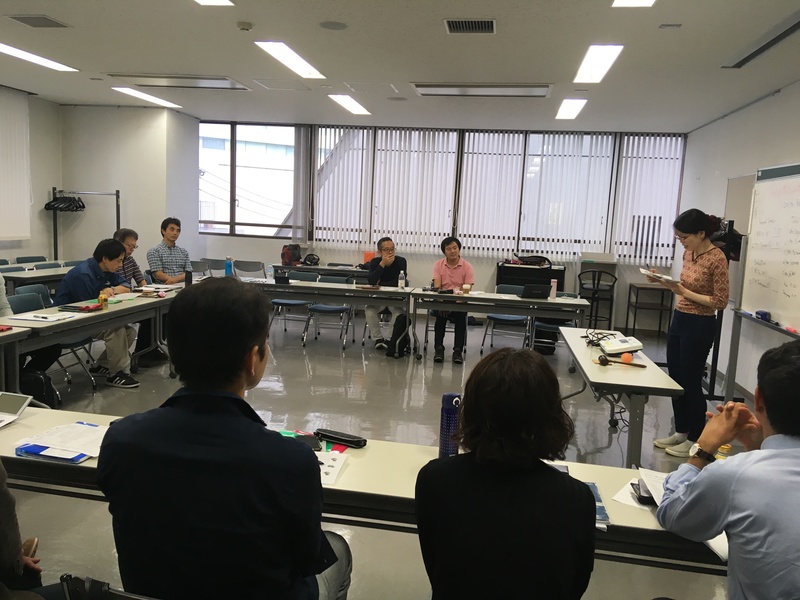 Anyway, we could successfully hold the 211th regular meeting with everyone’s cooperation. Summer is over and Autumn is coming! Our 209th regular meeting was held with the theme “YourFavorite Autumn- meeting” with as many as 5 honorable guests! Today’s agenda and whiteboard were decorated with pictures of coloring leaves suggestive of Autumn. “Call to order” (declaring the opening of the meeting) was took place by our president, TM TK. 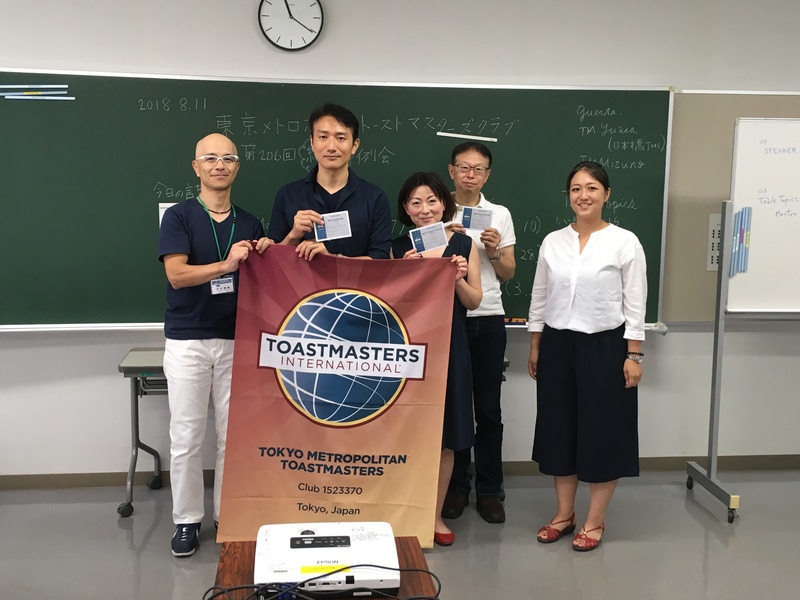 He introduced “Toastmaster Of The Morning”(TMOM) taken byTM SW. He asked all member to share each member’s favorite in autumn. “Word of the day” provided by TM HH, she introduced the word, “Fall” related to today’s theme Autumn.“News of the week” was delivered by TM HA, raising the topic of “Respect for senior citizen day”(In Japanese “Keirou-no-Hi”), explaining the trends of the population percentage of seniors citizens in Japan using visual effect. [Prepared Speech session] Today we had two speakers. Firstly, TM GS delivered speech titled “日韓合同例会 ” in Japanese. 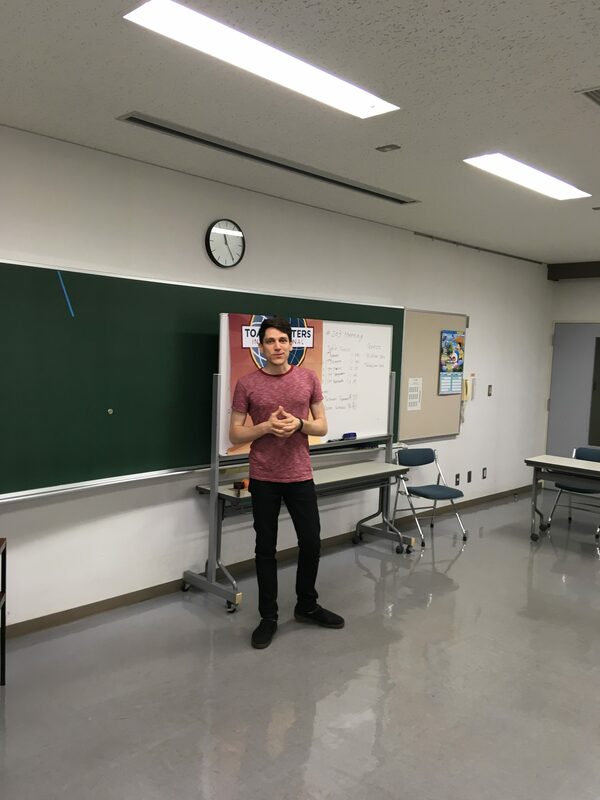 This is the second time for him to make a speech on this theme and he explained the background of “Korea-Japan joint meeting” and shared many pictures to help us imagine the next joint meeting. Kamaishi Unosumai Memorial Stadium constructed on the former site of school that had been destroyed in the tsunami during the 2011 Tohoku earthquake..
[Table Topic session] Today’s Table Topic Master is TM KT. He callon 3 guest for table topic that seemed suitable for each of them and each speaker performed excellent speech as if it were prepared speech. [Evaluation session] Today’s General evaluator is TMYK. Firstly, toastmaster TMTK gave the evaluation for the first prepared speaker. Next, TM NT performed the evaluation for the second prepared speaker. [Award Recipients] Best Table Topic speaker : GuestN and GuestM! Hot summer days again!! 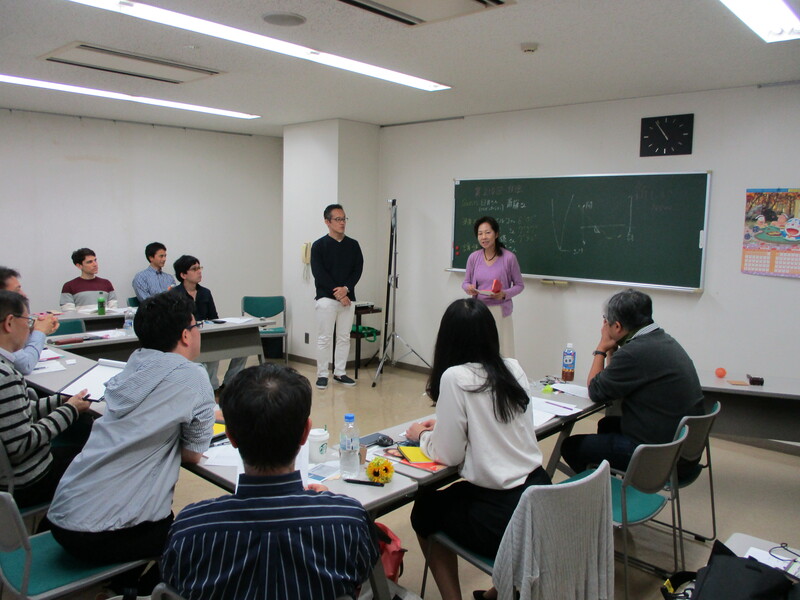 However, we, Tokyo Metropolitan Toastmasters club is “hot” in another aspect. 207th regular meeting was held with 12 attendees and one honorable guest. Today, “call to order” (declaring the opening of the meeting) was took place by our fresh vice president membership(VPM), TM SH. She introduced “Toastmaster Of The Morning”(TMOM) . This is the master of proceeding the meeting. This role was taken by TM YK. She took this role for the first time since around two years ago! “Word of the day” provided by TM YS, he introduced the word, “surprise”. Japanese citizens since the administrators raised this for the preparation of 2020 Tokyo Olympic games. [Prepared Speech session] Today we had three speakers. Firstly, TM SH delivered speech titled “Let’s try! !” in English. She spoke about her own experiences when she studied abroad. Secondly, TM HA performed speech in English, the title is “Say yes more”. It made all the attendees positive and heart warming. 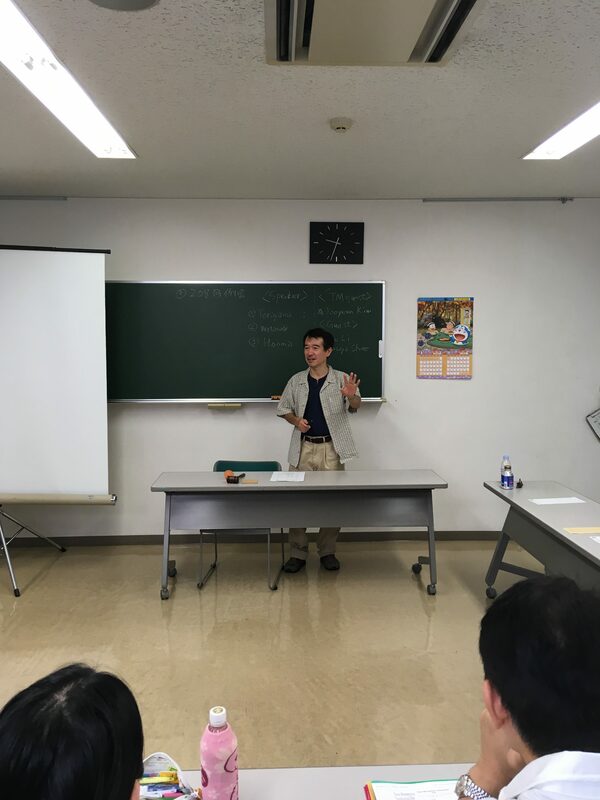 Lastly, TM GS executed speech in Japanese, as “日韓例会”. Explained the background of “Korea-Japan joint meeting” hosted by our club and Korean one which has strong relationship to us. [Table Topic session] Today’s Table Topic Master is TM SK. He took three(!) roles today but each one was well elaborated. He encouraged all the attendees to raise his or her hand if the one want to perform table topic speech voluntarily. That’s a kind of idea which TM SW(today he was absent) raised on the last meeting. Amazingly, all the four questions TM SK asked to the audience were taken the speakers who voluntarily raised his or her hand!! [Evaluation session] Today’s General evaluator is YT. Firstly, toastmaster MT gave the evaluation for the first prepared speaker. Next, TM TK performed the evaluation for the second prepared speaker. 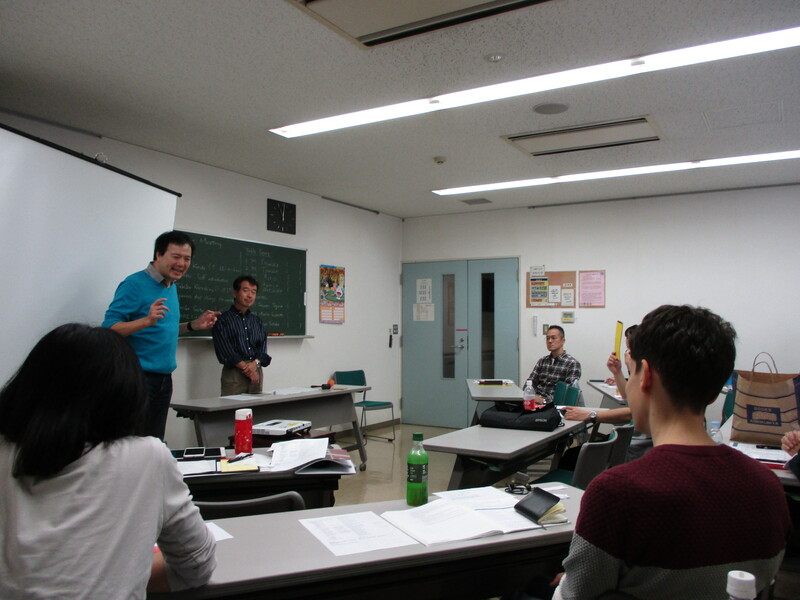 Lastly, TM HH delivered the Evaluation for the third prepared speaker in Japanese. On the ending of the meeting we held Induction Ceremony for Mr. TK who declared the will to join our club on the last meeting. Joining to our club was approved unanimously at the members voting. 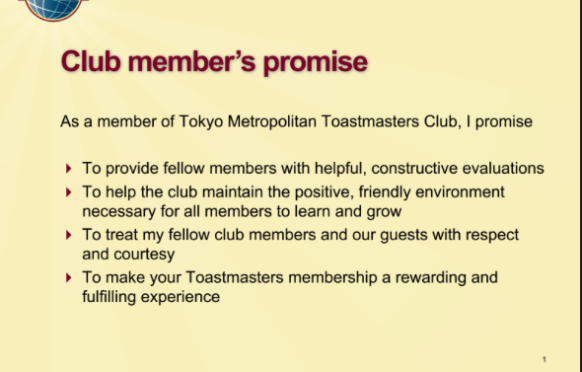 Mr TK read promise to the club members and we replied reading “club members promise” as the welcome message to the joiner. 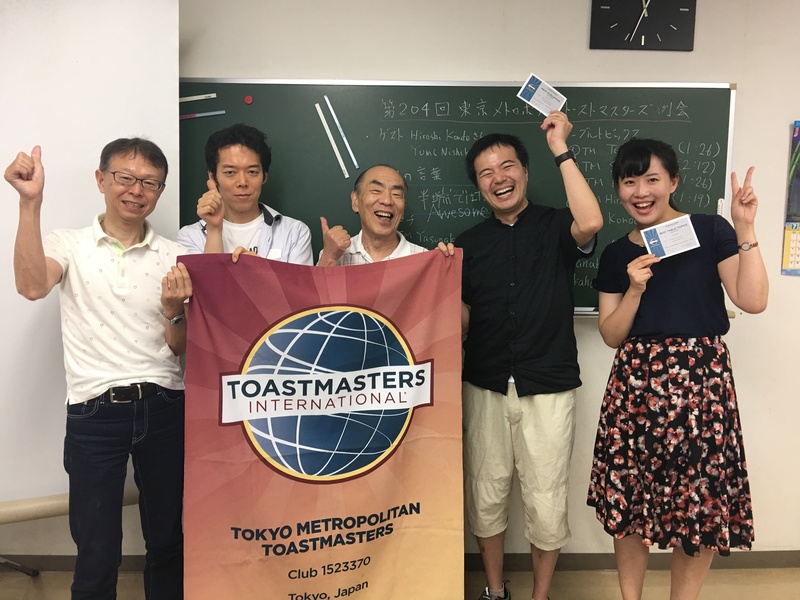 Stay tuned to Tokyo Metropolitan Toastmasters Club as we gain more momentum by welcoming new, intelligent and cool guy! Typhoon No.12 was approaching Kanto area, and we had been considering whether the meeting should be canceled or not. However, forecast said that it had been still far from Tokyo therefore we decided to hold the 205th meeting as scheduled. There were 14 attendees including one guest. Today, our new president, KT called to order on the beginning of the meeting. July is the very first month of fiscal year of toastmasters clubs. Unfortunately, he was absent the first meeting of this fiscal year so this was the first appearance of this term. After introduction of today’s guest, Toastmaster of the Morning(TMOM) was introduced, TMOM of this meeting is TM HH,“Word of the day” was presented by TM SW and he gave us the word “recovery”, since he has been have strong hope that Western Japan area which severely damaged by the torrential rain falls would recover as early as possible. On the section of “News of the week”, TM SW raised a topic of a kind of phishing SMS disguised as a notification from major parcel delivery operator. He actually had received such SMS onto his cellphone and he raised warning to audiences by clear and simple English speech so that all attendees were able to grasp the core of the messages. [Prepared speeches] We had three speakers on this meeting. Firstly, TM TN delivered “サードプレイスの効果” in Japanese. Based on her experiences of difficult for child caring and how she felt relieved when she resumed studying English interpretation. Then she suggested having ones each “Third place” to revitalize you. Next, we welcomed our president as the second speaker. He performed “所信表明” (policy expression) in Japanese since this is the first attendance to the meeting since the new fiscal year started. Finally, TM GS performed “My Target”. He gave us several episodes such as how difficult for others pronouncing his sir name. That made us fun a lot. [Table topic] Master of this session was TM YT. Provided several topics related to “record” since this summer is extremely hot, record breaking weather. [Evaluation] General evaluation is mastered by TM SK. First evaluator is TM MG, second is SH and third is HA. Every evaluator gave well elaborated evaluation with positive attitude that would contribute to further progress of each speaker. 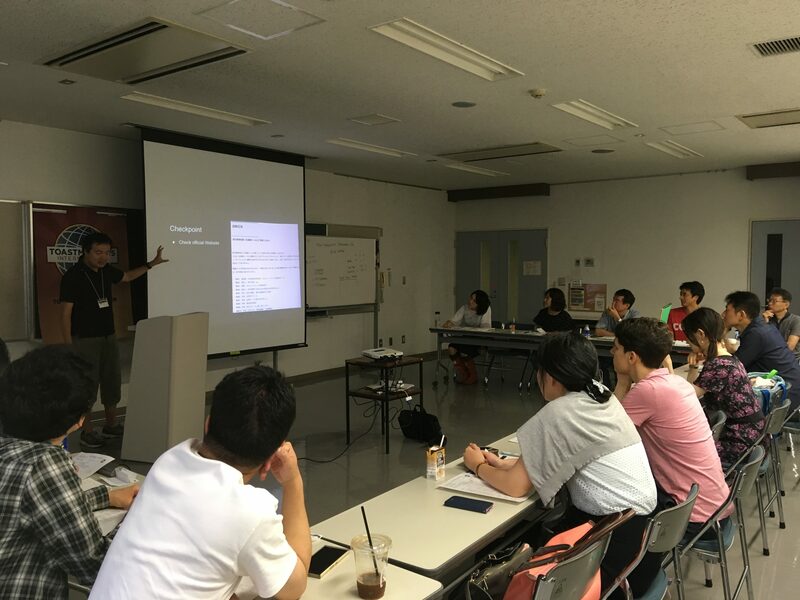 We held regular meeting #203 on June, 23rd. Detailed minutes coming up soon, so stay tuned!